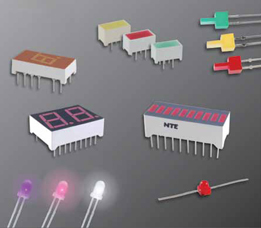 NTE has a broad selection of optoelectronic products designed to suit most every need. From standard discrete thru-hole LEDs and surface mount types to our newest addition, LED Lamps. Recently expanded upon is our selection of popular Super Bright LEDs in 1.8mm, 3mm, 5mm, 8mm and 10mm. New from NTE Electronics, high quality RGB + White Flexible LED Strips. These Flexible LED Strips, along with our LED Light Bars and Lamps, are perfect for a variety of applications including interior lighting, ceilings, shelves, cabinets, and showcases.